Buy Smittybilt X20 GEN2 Winch at CARiD and get $50 Visa Prepaid Card! Experienced off-roaders know how important it is to keep your Jeep ready for situations, when there's nobody around to ask for help. An aftermarket winch is one of the accessories, that let's you feel more confident when you're off the road, especially if its a winch from Smittybilt. Today we are here with a new summer sale on Smittybilt products! 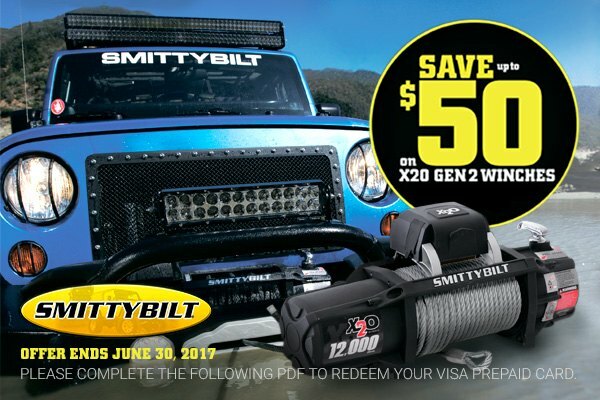 Buy a Smittybilt X20 GEN2 Winch and get a $50 Visa Prepaid Card. Act now— this offer expires on June 30, 2017. This winch has been enhanced in almost every area for increased performance and trouble free operation. The new 6.6HP amphibious motor offers the highest torque in the industry and is connected to a 3-stage Planetary Gear System for increased pulling power and line speed. The X20 Series features an all new integrated wireless remote control for ease of use and maximum versatility. It comes with T304 stainless steel handle and hardware, so you'll never have to worry about corrosion, a heat reduction end cap to prolong the life of the motor, galvanized aircraft caliber steel cable, a 4-way roller fairlead, hammer forged hook, and heavy-duty rubberized remote control with a front end magnet that makes locating and controlling the hand-held remote easier than ever. All this makes X20 Winch from Smittybilt the most versatile and advanced winch for your Jeep. Use the advantage of this promo and stay confident no matter what happens on your off-road trip! Please complete the following PDF to redeem your Visa Prepaid Card. Get $50 prepaid visa card with a set of Lund Fenders! Get the Original Smittybilt parts for less at CARiD! JK specific Falcon Shock Absorber Kit from TeraFlex at CARiD! Quick Reply: Buy Smittybilt X20 GEN2 Winch at CARiD and get $50 Visa Prepaid Card!